A little groggy this morning, but I was going to finish this last night! I machine paper pieced all of the corner blocks (Rachel's Storm at Sea design) two nights ago and had some of the patchwork squares started, so I just had to do more squares and sew it all together. I know I stretched out my inner square doing the embroidery, so I was very worried about it all fitting together. I managed to get it all lined up, with just a little bit of waviness. Hopefully the quilting will help it lay flat. Now I need to finish the embroidery this weekend while we catch up on Boardwalk Empire (so good!) and I will be all caught up for the next round of Handstitched Camp. 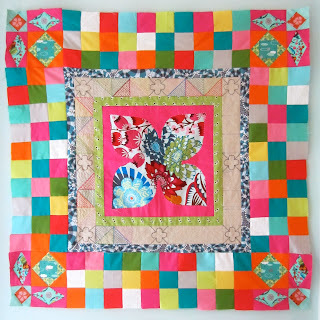 Wow, that patchwork is bright. I'm still getting used to it. This is, of course, the Modern Medallion Quilt from Handstitched Camp at Stitched in Color. Next week we are doing a border using applique. Lovely work! I love the colors you picked, they're very happy! I think it looks great! So pretty and summery! I am so behind!